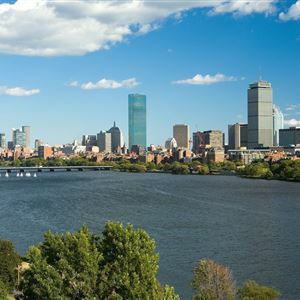 Property Location With a stay at Hyatt Regency Cambridge, Overlooking Boston in Cambridge, you'll be in the historical district and convenient to Boston University and Fenway Park. This 4-star hotel is close to Hynes Convention Center and Boston Museum of Fine Arts. Rooms Make yourself at home in one of the 470 air-conditioned rooms featuring refrigerators and iPod docking stations. Your pillowtop bed comes with Egyptian cotton sheets. Wired and wireless Internet access is complimentary, while 37-inch LCD televisions with satellite programming provide entertainment. Private bathrooms with showers feature designer toiletries and hair dryers. Amenities Be sure to enjoy recreational amenities, including a health club, an indoor pool, and a sauna. This hotel also features complimentary wireless Internet access, concierge services, and gift shops/newsstands. Getting to nearby attractions is a breeze with the complimentary area shuttle that operates within 2. 00 mi. Dining Satisfy your appetite at the hotel's beachfront restaurant, where you can enjoy drinks at a bar and dine alfresco (weather permitting). Snacks are also available at a coffee shop/café. Quench your thirst with your favorite drink at a bar/lounge. Buffet breakfasts are available daily for a fee. Business, Other Amenities Featured amenities include complimentary wired Internet access, a 24-hour business center, and limo/town car service. Planning an event in Cambridge? 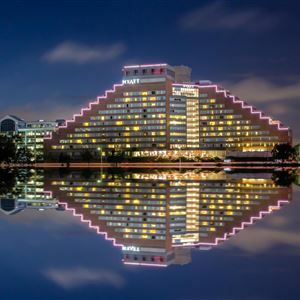 This hotel has 25000 square feet (2323 square meters) of space consisting of conference space and meeting rooms. Self parking (subject to charges) is available onsite. With a stay at Hyatt Regency Cambridge, Overlooking Boston in Cambridge, you'll be in the historical district and convenient to Boston University and Fenway Park. This 4-star hotel is close to Hynes Convention Center and Boston Museum of Fine Arts. Be sure to enjoy recreational amenities, including a health club, an indoor pool, and a sauna. This hotel also features complimentary wireless Internet access, concierge services, and gift shops/newsstands. Getting to nearby attractions is a breeze with the complimentary area shuttle that operates within 2. 00 mi. Satisfy your appetite at the hotel's beachfront restaurant, where you can enjoy drinks at a bar and dine alfresco (weather permitting). Snacks are also available at a coffee shop/café. Quench your thirst with your favorite drink at a bar/lounge. Buffet breakfasts are available daily for a fee. Featured amenities include complimentary wired Internet access, a 24-hour business center, and limo/town car service. Planning an event in Cambridge? This hotel has 25000 square feet (2323 square meters) of space consisting of conference space and meeting rooms. Self parking (subject to charges) is available onsite.